Our New Arrivals showcase the best of classic Disney art! Call or email about these originals and we'll send all the details. will be available. All the best, John and Wanda. SWORD IN THE STONE - Madam Mim - Original hand painted production cel. SLEEPING BEAUTY - King Stefan and King Hubert. us for price and availability. PLUTO CARTOON - Pluto and Bobo. Original hand painted production cel. 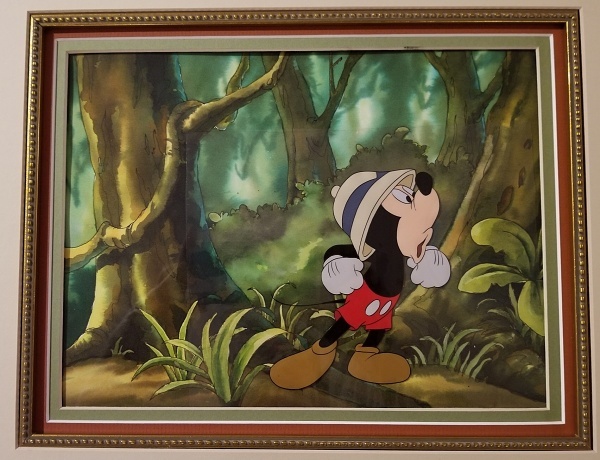 DISNEY PUBLICITY CEL - Jiminy Cricket. Original hand painted production cel. MICKEY AND THE ARMADILLO. Mickey Mouse. SONG OF THE SOUTH - Brer Bear. DISNEY SHORT - Chip and Dale. Contact us for price and availbility. DISNEY TV - Cat from "The Great Cat Family"
ROBIN HOOD - Little John. Original hand painted model/publicity cel on print background. PETER PAN - Indian Chief. BLUSTERY DAY - Pooh and Nightmare characters. Original hand pencil concept drawing..
CINDERELLA - Cinderella and Anastasia. THE ARISTOCATS - O'Mally and Uncle Waldo. ALICE IN WONDERLAND - Alice. ALICE IN WONDERLAND - Alice and Tweedle Dee and Tweedle Dum. FANTASIA - Madam Upanova from the "Dance of the Hours"